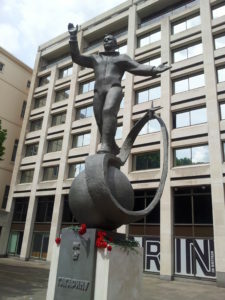 To mark the 50th anniversary of the world’s first spaceflight by cosmonaut Yuri Gagarin on 12th April 1961, a statue of Gagarin made in Russia was unveiled in London in on 14th July this year. The limited planning permission means it must move by July 2012. Gagarin came to Britain because he was invited by the Manchester based Amalgamated Union of Foundry Workers. Prior to joining the Soviet air force, Gagarin had trained as a foundryman. An online petition to bring the statue from London to Manchester in 2012 is now live. Read more about this campaign and sign the petition here.